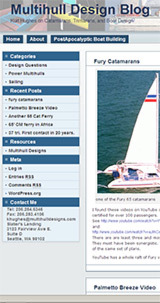 For complete information on my multihull Stock Designs, order the New Sailing Designs Multihull Portfolio. It's stuffed with illustrations of all my stock designs, plus tons of helpful design and construction info! At this time there are 90 stock designs listed my Design Portfolio. They are all new work; no recycled old sets are to be found in the lineup. These are not cheesy little "cookbooks" - they are real plans with professional D size sheets! The following vessels are now in my stock set inventory. More are being added all the time. 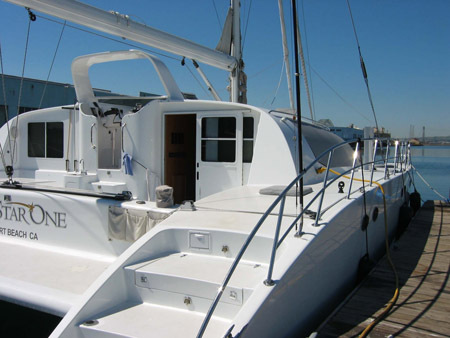 The stock multihull designs in my Design Portfolio are kept continuously updated. Every stock design set benefits from any new information or technology. Even the earlier hand drawn stock sets have the most recent computer generated hull lines, as well as many other sheets that are recent upgrades. These stock design sets are probably among the most complete in the business. I try to have the plans answer every possible question that a builder might have, beginner or professional. These plans have a very high level of detail. As an example, a typical recent thirty-foot cat has some 29 sheets of drawings. Another cat, fifty-three feet long, has almost 60 sheets of drawings. As noted earlier, besides the drawings, stock sets include a Details Book, Construction Manual, a Construction Manual on DVD if it applies, and all the technical support a builder might need. Naturally, with continuous updating, even sets that are complete are still in process. Any office that has every sheet ready at the first mailing has not kept the work up to date.